Hikers come in all shapes and sizes, various levels of skill, goals and determination. I am an extremely serious hiker with many years of experience and even I find that my hiking tastes change according to the season, who I am bring along with me (if anyone), the days weather, how I am felling that day and just my whim de jour. When hiking in the Smokies and I am choosing to make it a light day by hiking maybe 4 - 5 hours in a new area I prefer to not look at my map (I always have one tucked away in case of an emergency) or any of my Smoky Mountains Hiking guide books. I love the let the Smoky Mountains unfold beneath my feet and let every twist and turn surprise and welcome me to push further. This method of going into the wild without studying the terrain is foolish for beginner and intermediate hikers, when hiking in completely unknown regions or more rugged terrain than what can be found in the park. Bad weather in the Smokies - especially in the fall, winter and spring can turn a simple hike into a nightmare. Landslides and mudslides can occur without warning making some trails impassable so it can become imperative to find an alternate return route while out in the field. Hiking blindly can be extremely inefficient time wise and few people beside locals and professionals such as me have the luxury to spend a lifetime to explore the Great Smoky Mountains. If you can only come to the Smokies for a few days or even a few weeks a year and wish to see most or all of the smokies in a reasonable amount of time this is not the way to do it. My bible to the Smokies for the past 10 or so years has been the book Hiking Trails of the Smokies by The Great Smoky Mountains Association. This small pocket size book has most of the trails to the park listed alphabetically with decent trail descriptions, a cross section of elevation changes on each trail and a full size map in the back. Great reference material and easily slips into a camera bag or backpack. This book is an good guide if you wish to research the trails in the Smoky Mountains National Park on a trail by trail basis. If you are looking to hike the entire trail system in the Smoky Mountains National Park there is a far more efficient manner you are going to love, the hiking guide I have read: Day hikers guide to all the trails in the Smoky Mountains by Elizabeth L Etnier which is now in its 3rd edition. 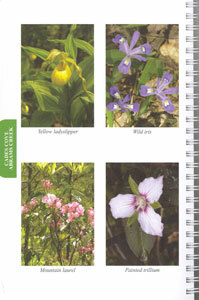 At first glance you can see that this hiking guide is not like other Smoky Mountain National Park Hiking Guide books. Wire bound, pretty color photography throughout the 136 page guide, beautiful detailed color maps and color enhanced tables are what you first notice. Beautifully written descriptions, attention to detail and impeccable research is what keeps you coming back to the book again and again. This wonderful hiking guide book not only takes you through the hiking trails of the park, but informs you about local accommodations, shuttle services (with detail information and phone numbers), and the seasonal wonder and challenges of the Great Smoky Mountains National Park. 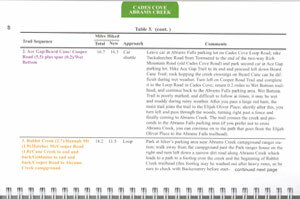 There is also a handy 5 page index of trails near the rear of the book which refers to corresponding pages in the guide as well as the hike number. All of the Appalachian trails are grouped together in alphabetical order. Example of detailed map in the hiking guide book. Hiking descriptions for national parks trails. There is also a comprehensive checklist of trails broken down by area of the Great Smoky Mountains National Park and then listed in alphabetical order. 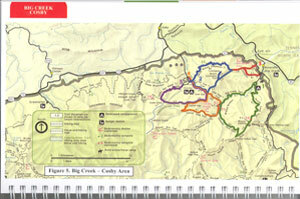 Each trail has its corresponding mileage listed and a personal check off area for when you have hiked the trail. My hint for the day is that the spiral binding of the Day hikers guide to all the trails in the Smoky Mountains makes it easy to make photocopies of the pages you need on the trail so you don't have to take the whole book along with you while you are hiking on the trails. 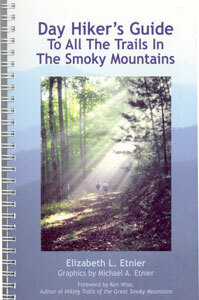 Without a doubt if you are a serious or even a casual hiker of the Smoky Mountains and you wish to get the most out of every hike you make in the Smoky Mountains National Park this book is a must.